Terminator: The Sarah Connor Chronicles: "Born To Run"
Season finale time for Sarah Connor Chronicles, and at the start of "Born to Run," it's hard to know what to expect. Last week offered some definite promise, and as always, the threat of cancellation looms heavy; any reasonable assessment would have to admit that the chance of this series getting renewed for a third season are regrettably slim. So not only does Josh Friedman, show creator and the writer of tonight's episode, have to resolve the events of the last eight months into one conveniently digestible forty-minute package, he's also got to take into account that this might be the last we'll ever see of his version of Sarah, John, and the much-loved Cameron. How do you deal with that? How do you satisfy your fans, while not completely closing the book on the future? Unsurprisingly, a lot of talk is involved. And a lot of echoes from the first two Terminator movies as well. Once again, Sarah is in captivity; this time it's jail and not the local asylum, but her and John's response is the same. She closes down to the investigating officer (Agent Aldridge, played by West Wing's own Joshua Molina—it's funny how ever line he delivers sounds like Sorkin dialogue), but opens up to a priest, Father Bonilla, who you may remember from his appearance back at the start of this season. Bonilla saw some messed up stuff, so he's willing to help Sarah get passports and a message to John: leave. No rescues, no jail-breaks. She wants John gone. We all know how well that's going to work, right? One of the flaws of "Run" is that it spends too much time getting accomplished things we know have to be accomplished, pushing all the surprises and weirdness to the very end. John and Cameron haggle over what to do next, and there's some discussion about Sarah's possible cancer—it's a plotline that right now seems too nebulous to really matter (after all, the main reason Sarah thought she was sick turned out to be something else entirely), and while John's comments to Cameron about bad radiation shielding are clever, the whole cancer scare was started because the Sarah that didn't time travel died that way. Without any exposure to rad-leaking she-bots, I might add. But John's suspicions may contribute to what has to be the ep's most uncomfortable scene, with Cam taking off her shirt and bra and telling John to "get on top of me." It's just her having doubts about her functionality, and needing John to cut her open and check the, ahem, equipment, but the whole thing is shot to play up both Summer Glau's obvious hotness, and the confusing nature of Cam and John's relationship. While I appreciate anything that isn't boring happening, I don't know if this is really a profitable avenue to go down. The series hasn't earned the right to get all weird about robot sexuality—that sort of twist requires a deft hand, something we've seen only intermittent evidence of so far. While the Connors stew in their various juices (hey, neat, I just made it ickier! ), Weaver decides she simply has to meet with John. She and John Henry have been watching Sarah's case with interest, and Weaver sends Ellison to John with an offer, and a question: "Will you join us?" Which, of course, goes back to what we heard in the last future flashback with Jesse and the Jimmy Carter. As others have speculated, and the Law of Conservation of Characters demands, it's safe to assume that Weaver is the T-1000 we saw back on the sub. Or if she isn't, she's one that was given a similar offer, and answered in the affirnative. Except when Ellison puts Cameron to the question, she acts like she doesn't know what he's talking about. What the hell is up with Cam this episode, anyway? I've said before, while this show supposedly tells a cohesive story from episode to episode, sometimes it seems like each new ep we get doesn't entirely line up with the one that preceeded it; in some indefinible way, it's like getting a brand new, entirely familiar series every week. We're clearly supposed to have made judgments about Cameron's abilities over the course of the season, and there have been intimations. Tonight, though, everything got all mournful—did she kill a kid while I wasn't looking? It's not that hard to see the intention, but we're missing a few much needed developments. When Cameron strides into the prison to break Sarah free, getting herself wrecked up in the process, it's inevitable, but I kinda wish we'd spent some more time on why. Although, really, any complaints on "why" should be relegated to "Run"'s final ten minutes. Sarah's out of prison, Cameron's lost her looks and some of her functionality, and it's time to finally meet up with Weaver and John Henry. 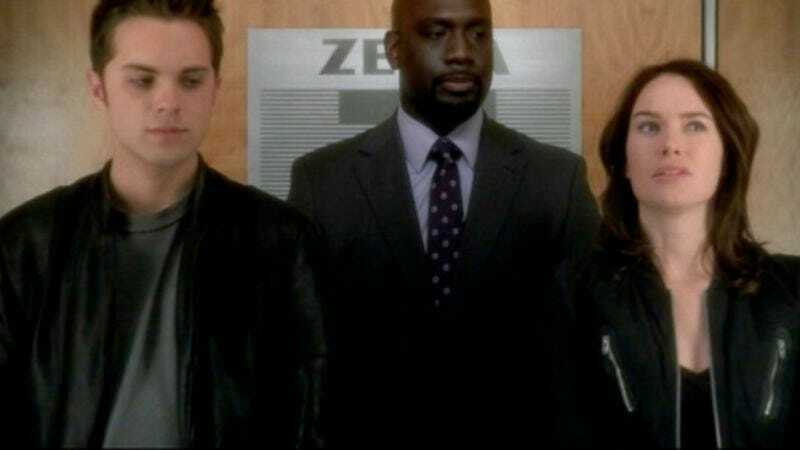 There's a nice moment here when, after the thrill of the jail-break, John and Sarah are forced to wait in the lobby before Ellison comes to fetch them. (Equally nice is the three-way conversation during the elevator ride.) The Weaver meeting confirms what we've figured out, just as a drone from, I'm guessing, the actual Skynet crashes into the building. Weaver turns into a metal shield to protect the humans, and then everybody heads to the basement, where Cameron is supposed to be taking out John Henry's chip. Things worked out differently than planned, though, as Cam has apparently lobotomized herself, leaving her empty form and a message, "I'm sorry John." And that's how we're left, now and probably forever. One last piece of info: in this future, nobody's ever heard of "John Connor." (Of course they haven't; by jumping ahead, John took himself out of the revolution.) Apparently, the Resistance is still around—it's gotta take some balls to end your series by contradicting the main premise of the franchise it spun off from. (Namely that without John Connor, we're toast.) Points for that. I can appreciate the boldness of this, but really, it's too random. If we'd had better building blocks up to this point, or if the relationship between John and Cameron had been better developed, or, hell, if I liked any of the characters who weren't "metal," this could've been impressive. As is, I'm guessing we'll be reading summaries of it in "Over Too Soon!" articles for the next five years or so, and that's about it. Hey, John Henry playing D&D! DM'ed by the techie, of course. And of course JH rolls natural 20's, if he wants to. Why bother bringing back the Derek-killing Terminator and give him two scenes (another reference to the franchise, this time to the first [and still best] Terminator; only this time, the machine doesn't actually kill the gun-shop owner) if you're just going to have Weaver take him out with no plot ramifications? Great Weaver/Sara exchange, re: Savannah: "She's the light of my life, and I'd be lost without her." "Where is she?" "Let's assume school." Plausible or not, having Sarah's "I love you" follow John through time was neat.